This is the largest bingo card available on the market! This card is ideally suited to make it easier for people with impaired vision to play bingo. 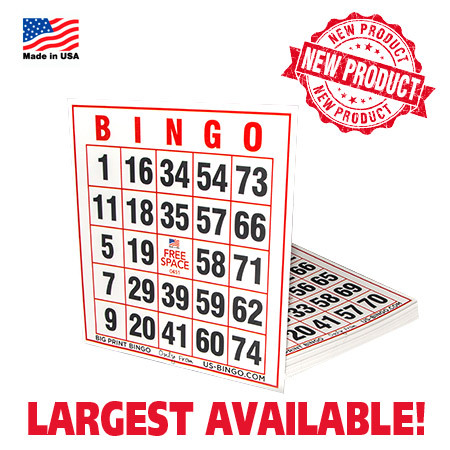 Each Extra Large Jumbo Bingo Card is 9.75 inches wide by 10.5 inches tall and has large bold 1 inch black numbers. It is printed on sturdy 18pt cardstock and can be used over and over again. (Business cards are typically printed on 12-14 pt thickness stock for comparison) 3000 Unique cards available! Free space has serial number to keep track of cards Call to find out about larger quantities and customization options! More Info..
Customize these cards with your logo! Wallet size safety bingo cards are more convenient. CALL TO GET YOUR CUSTOM CARDS FOR YOUR COMPANY. Order by the box or case and save $$$$$ An $80 Art and Setup charge will be added to first order. A $30 Setup charge will be added to re-orders of less than 4 packs (600 cards). Many larger companies already have artwork done and the art charge will be waived - please call. More Info.. 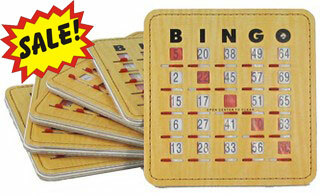 Call for Quantity Discount on Shutter Bingo Cards! Our economy version of the Deluxe Bingo Slide Card. 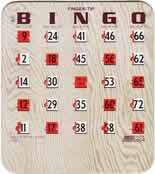 This 5 ply bingo shutter card is 25% heavier than most similar bingo shutter cards sold elsewhere. Great for bus trips, school events, company picnics, family reunions, or other places where you don't want to mess with chips or daubers. 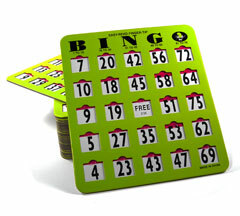 Call for Quantity Discount on Shutter Bingo Cards! 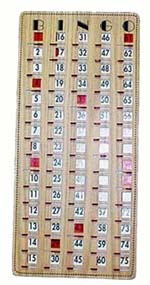 More Info..
8"x 9" with 3/4" Numbers These bingo shutter cards make it easier to play bingo for visually impaired players. Excellent for retirement homes and senior centers. Slide Masterboard. Great for bus trips. 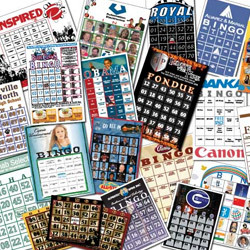 These BINGO cards are printed on high quality bright white heavy paper, and can easily be reused if used with bingo chips or markers. One bingo card per sheet. NOT DIE CUT - NO PUSHOUT TABS! MUST USE DAUBERS, CHIPS OR MARKERS! 250 Sheets per pack More Info..